Painters, poets, philosophers, photographers... all are drawn to that special paradise of Provence..... its natural beauty, distinct lanscapes, traditional charms and mediterranean spirit.... Today it continues as a center for artists. 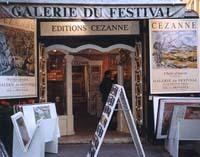 Throughout every village there are ateliers and galleries where artists work, display, and often live. They are inspired by their amazing heritage. Paul Cezanne, Pablo Picasso, Frederic Mistral, Marcel Pagnol, Alphonse Daudet..... and the list could continue forever!